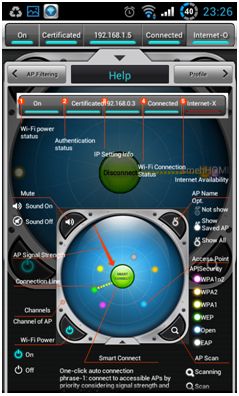 Published by Appster Co, Smart WiFi Pro is a Wi-Fi managing application. It allows you to scan available Wi-Fi networks and manage your connections. 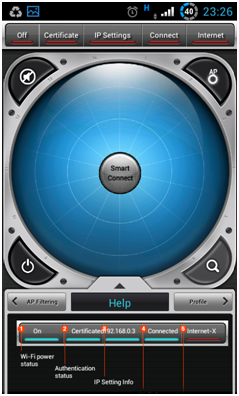 Appster Co’s Smart Wi-Fi Pro has jammed many useful features in this app, so not only is it useful but it allows fine control of your Wi-Fi connections. 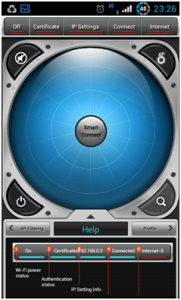 The interface is extremely modern and graphical style suits the application concept. The main screen shows a radar style view with 14 channels equally spaced around the display so you can easily identify which channels will have more interference and which are free. The top bar has general information regarding the status of the Wi-Fi connection that has been made. At the center of the display the “Smart Connect” button allows you to make a Wi-Fi connection without thinking about which Access Point (AP) to connect to. Around the edges are the following options (Sound = On/Off, AP Name = Not show/Show Saved AP/Show All, Wi-Fi Power = On/Off, AP Scan = Scanning/Scan/Not Available). At the bottom of the screen is a pull up/pull down style of menu showing three additional screens. 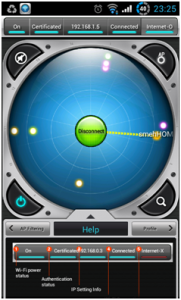 By clicking on the arrow in the middle the screen can be brought up to fill the entire display. 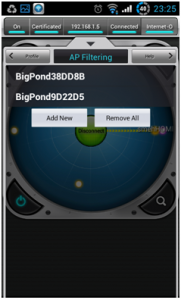 The following additional screens are Help = showing descriptions of all buttons and options, Profile = Showing saved AP’s, AP filtering = showing any AP’s you have chosen to filter out from the app. If you hit the menu button you have the option to enter the app settings. This is where the real power of Smart Wi-Fi can be accessed. 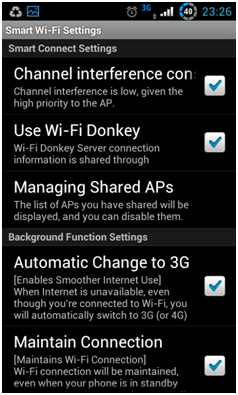 Here you have the ability to use the Wi-Fi Donkey Service, which allows Smart Wi-Fi users to access secured AP. Also in the settings are a couple of really useful features such as “Automatic Shut Down” which turns off your Wi-Fi if it hasn’t been used in a pre set time. Scan period for detecting new AP’s and a whole stack of other options. Two gripes I have with the settings are that option with long titles are not scrolling and too long for the screen, therefore making them unreadable. Additionally, whilst the Automatic Shut Down feature works, there is no option for automatically turning it back on again. 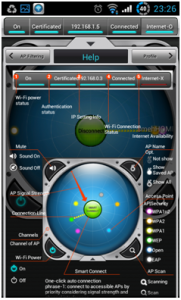 Overall, Smart Wi-Fi Pro is a fantastic looking app that just needs a couple of tidy ups and small fixes that will remove the annoyances and make it a very polished useful app. 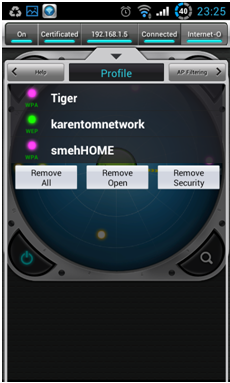 Check outSmart WiFi Proin the Google Play Store.